These metrics of regulation convey information about the agencies creating regulation as well as the industries or sectors mentioned in regulation. RegData 2.0 can produce statistics for hundreds of different regulatory departments, agencies, offices, and commissions. This permits a more complete characterization and measurement of regulatory accumulation for a specific sector.1 For example, RegData 2.0 tracks how often a sector is mentioned in federal regulation over time, which agencies are mentioning the sector, and what the long-term regulatory trends are in these agencies and for this sector. The second section of this report explains these metrics in detail and gives some statistics and figures for five agencies. Three of the agencies are housed in the Department of Transportation and were selected because at least some of their regulations directly address railroads or railroad safety. Two agencies were selected from the Department of Labor as a way of examining the relevance and possible overlap of workplace safety regulations to railroad and railroad safety regulations. The third section offers brief concluding remarks. This brief includes a data appendix. For this report, we have limited our analysis to a sample of five agencies that were determined as likely to be important to the railroad industry. Three of the agencies were selected from the Department of Transportation as agencies likely to promulgate regulations that directly address railroads or railroad safety. The other two agencies were selected from the Department of Labor as agencies whose regulations may be directly or indirectly affecting the railroad sector. However, RegData 2.0 could be used to produce statistics similar to those presented here for other agencies within or external to these departments. The RegData metrics of regulation for these agencies and the railroad transportation sector are explained in detail below. When applied to specific agencies, search term count measures how often an agency uses these sector or industry-specific search terms each year. The user can compare the relevance of different agencies to an industry by comparing search term counts. In general, the more search terms for a specific industry or sector are found in an agency’s text, the more relevant that agency’s text to that industry or sector. Furthermore, changes in search term counts over time likely indicate changes in the relevance of the agency’s text to the industry or sector. Thus, if an agency’s search term count for the rail transportation sector is increasing over time, then it is likely that an increasing amount of that agency’s text is relevant to the rail transportation sector. Note that simply finding a search term may not indicate that the industry was restricted in some cases because search terms could be used in exemption clauses or as information only. Figure 1 below shows the total number of times railroad search terms were found in each year from 1997 to 2012 in the regulatory text of the five agencies studied in this report (Federal Motor Carriers Safety Administration [FMCSA], Federal Railroad Administration [FRA], Mine Safety and Health Administration [MSHA], Occupational Safety and Health Administration [OSHA], and Pipelines and Hazardous Material Safety Administration [PHMSA]4). The data plotted in figure 1 is the aggregate search term count for all five of these agencies. As figure 1 shows, railroad search terms were found 3,644 times in these five agencies’ regulations in 1997. In 2012, the same search terms were found 5,319 times—a 46 percent increase. 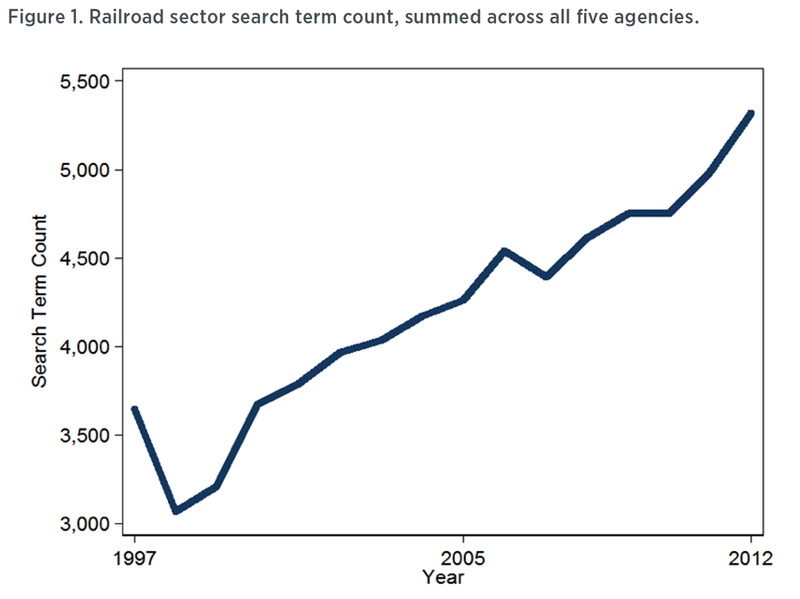 By way of comparison, all other agencies (that is, all federal agencies except the five shown in figure 1) mentioned railroad search terms 18,128 times in 1997 and 20,586 times in 2012—an increase of 14 percent.